This post is a reflection of my journey exploring Common Sense Media-educator curriculum while going through the Common Sense Educator recognition program. I’m a technology teacher, once integration specialist. I love working directly with kids and learning cutting-edge technologies every day. In the trenches I truly know how kids learn and discover creative ways to deliver instruction in my computer lab. Digital citizenship was once a peripheral idea. So much time spent on learning digital media and coding not enough on being a safe and responsible digital citizen. I used to teach a class called Information Literacy. This elective course used technologies to critique websites and share collaboratively using cloud tools. The course became increasingly unpopular due to its title, so I recently changed it to Social Media. I’m using more Common Sense Media curriculum and social media tools as marketing tools. I have found the material to be very helpful. However I did find the format to be geared toward younger kids, I adapted the look and feel for my HS kids. I have been increasingly interested in working with students to navigate this new social experience. Long online and face-to-face discussions ensue. During discussions with students around fake news, it was challenging to maintain a neutral political position and to foster healthy balanced discussions. During that experience I may have isolated some students. I need to find a better way to engage in those conversations. On June 12th, we hosted a parent night which included the movie, Screenagers, followed by a 10-person panel made up of students, parents, administrators and a medical/psych professional. In addition, the four elementary schools had a viewing along with a student panel comprised of high school students. This was a very rewarding experience. Parents who attended felt this sort of activity was far overdue. Many spoke passionately about the difficulties at home. Students who were involved expressed gratitude for the opportunity to hear adults who were not their parents voicing these concerns. Likewise, the parents also noted it was nice to hear student perspectives from other kids. Digital citizenship is a necessary topic to explore, and it is now at the forefront of my teaching. I no longer just teach multimedia and coding. I now integrate ethics into computer science and responsible computer use durations. I advise the school bike club, and model for my students its good to get out and enjoy the weather too. It’s tough to say, but I’m middle-aged now. When we are young, we are always the ones to master technology in the family. Take the VCR for example. Back in the day it was always easy for me because while my parents were busy being parents, keeping the house in order, working to pay the bills, spending free time relaxing, maybe reading, I was tinkering with my surroundings. If something wasn’t working out, I tried other ways and overcame each challenge. As I grew older, I always tinkered with the next new thing I was faced with. I grew into each version of personal computer, palm pilot, cell technology, etc. My parents? Not so much. This trend is important in what I’m about to say next. I just discovered that the learning management system (LMS) that my school has been using since I arrived eight years ago is about to go away. I built up my technology class curriculum on countless proprietary web pages hosted on a third-party educational platform. I did it because it was new. It was new to the district, and I was also new to the school. I had nothing to lose, and I went all in. The entire staff was asked to upload their content to the platform for students and parents. Since I ran a computer lab, I put all of the lessons online so students could access immediately the tasks conveniently in a calendar, much like an online class. Soon I was asked to give workshops on how to use the platform. Before my arrival at my school eight years ago, I spent 11 years creating web content delivered using Frontpage, Publisher, PowerPoint (as a website), shared network folders and so on. Each of my lessons had to be changed with each update and revision of the software. MS Office, for example changed so much that literally every two years I would have to update my tutorials. In the past 18 years, I’ve explored each new buzz in technology. From Edmodo, to iPads to Google, I’ve invested time and energy into each new thing. It’s no wonder my job seems the most stressful of any educator I know. I’ve been shell shocked by many rugs being pulled out from under me. For example, a few years after NING came out in 2005, I saw classroom potential for social networks. I created one for each class and engaged with students online, each student creating a digital portfolio. I found it useful as an educational platform for engaging students. I gave workshops and even presented at my local state conference. I had decided to let it go once it moved to a paid model. Besides, other platforms were coming online. Edmodo — remember Diigo and Delicious? I was accepted into the beta of Google Wave which was quickly dropped by Google. From the onset of Google, I was all in. I still have the same email since Gmail was introduced. I’ve been a faithful Android user with the very first Motorola Droid, currently loving my GalaxyS5. Making the most of everything Google — from personal calendars, Drive, Maps, Keep — I consider myself, well, skilled in the Google arts. Along with Google Forms and YouTube videos (hours upon hours of tutorials) not transferring well, I’m reluctant to invest my energy into the school Google Apps for Education platform. 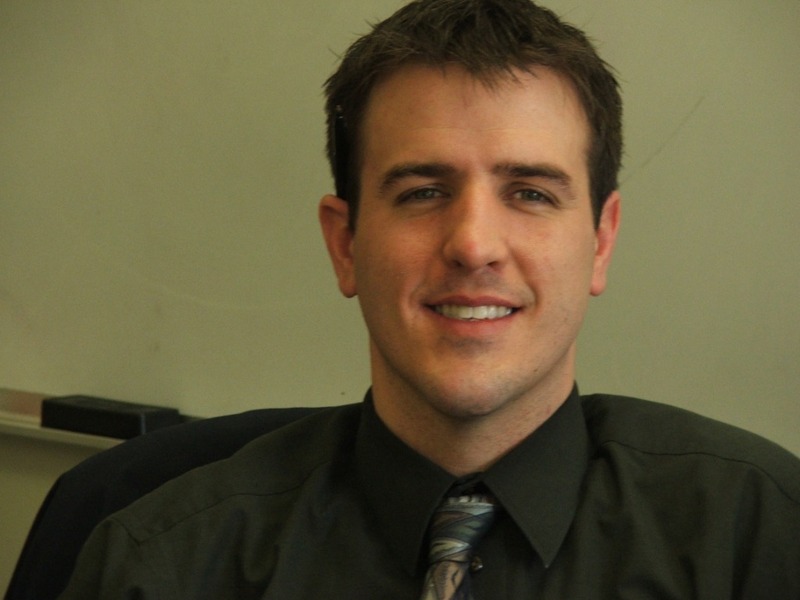 What does it mean if I were to transfer to a new teaching job? Would the school want my curriculum? Sure some things transfer well, but the links do not. So all of the linked documents, YouTube videos and forms? There is a convenience with the Apps for Ed platform, especially with the Google Classroom, but growing into such an environment has me feeling a bit uneasy. So I’m at a crossroads. My LMS is going away and while I am already settling into our district Apps account, I’m trying out Classroom full throttle. It’s no LMS. In the meantime, I’m also exploring Google Course Builder, but it seems too new and unstable. But I have faith, even knowing it could go either way. Google has been a long-time friend of mine. So when we look at the big picture and we see veteran teachers reluctant to latch onto new technology, we need to consider their journey before we pass judgement. We’ve seen too many trends to allow ourselves to spend too much time on the newest ones. Like my parents when I was a kid, I now need to choose carefully how I spend my time. Lately I am more reluctant to tinker as I have all these years. Call it shell-shock. Call it wisdom. In any case, I’m sure in time, I will find my new LMS home. The buzz about gamification in education has been in my Twittersphere for some time. I’m only recently beginning to examine the importance as it relates to differentiated instruction. How can I provide learning opportunities at different levels and reward students for achievement? When we ask kids what work is, they would respond “school” and if asked what is play, they would respond “games”. Everyone loves a game. Why not? A game gives challenges with a lighthearted dance of successes and failures. Games consist of positive reinforcements and negative ones too. Kids truly need to get points for showing up. Don’t you think? Kids may not see the long-range goal, but can find motivation is shorter ones. My computer technology courses have developed into a blended model of instruction whereby the content is presented online with tutorials and clear steps for completing tasks. These “webquests” as they were once called, allow the student to work steadily at his/her own pace. Over the years I’ve created more and more activities and sorted them into modules. Students are given start and end dates for completing the module assignments. The difficulty level of the activities are sorted from easy to hard. I’ve created so many activities that I’ve come to a point where we do not have time to complete them all. I also find some students take longer to complete the tasks than others. A research project aimed at individualization in Technology Enhanced Learning analyzes personalized learning describing the way that learners work and solve the problems they are given while learning. It is noted that the use of the word personalization is often confused with individualization and differentiation. Personalization is learner-centered where the learner is driving their learning and actively participates in the design of their learning, while differentiation and individualization are teacher-centered where the teacher customizes instruction based on the needs of the individual learner. 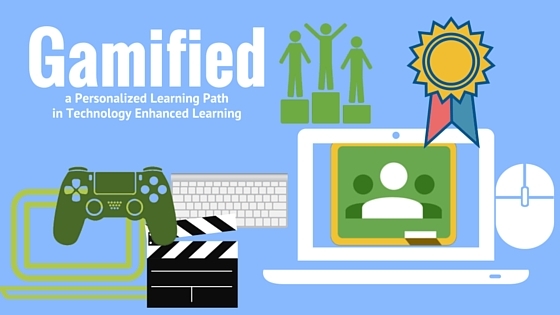 Gamification is personalized because it gives students an opportunity to choose their learning experiences. Students are empowered to seek engaging activities which will help them find success. The learner has a voice and choice which means that the learner can decide which activities are more engaging for them and shape the course in collaboration with the teacher (Zajac, 2014). Differentiation of instruction should coexist with the personalized experience. Along with multiple projects and activities, there should be a number of instructional modalities. For example, the instruction can be in the form of text on the screen and video tutorial. The personalized product can be generated on paper, in a slideshow or made into a real-time video. With the aid of technology, the four learning styles (visual, aural, verbal and logical) are addressed by different forms of learning content while kinesthetic, social and solitary are reflected in adequate activities (Zajac, 2014). Gamification implications include individualization with project-based learning as well as collaboration. Group work in the gamified environment may include roles of leader, researcher, co-worker and player. The breakdown can allow for opportunity for the teacher to assign individual tasks to students based on strengths. To make things confusing for myself, I kicked off an experimental unit of gamification last year with my unit on making games here called The Scratching Post — programming games in Scratch. (It is the first time I’ve attempted to build a quest using a Google document published as a webpage. Google needs to work on the formatting – I’m not fond of sharing documents “can view” as that looks horrible too). Enough of the visual critique. The most challenging component is the scoring. It is difficult to determine what success is. While students could elect their path for the final product, points are given based on the percent of elements used in their product. It is hard to determine what was acceptable for kids to skip and what is an essential skill I want them to gain. I attempted to implement levels. I didn’t think I made the most of those. Overall I think it was fun. The students enjoyed it, but I don’t think they paid any attention to the gamified elements. This may be because the content was making games, which is confusing. If it were built around learning about internet safety, there might have been more awareness of the gamification. Platform – I am happy with my current delivery method. I create content in modules and time release them using the Edline website. I may explore third-party software as described above. Leaderboard may be displayed on the website or in the classroom using digital signage software. There is web-based software available for assisting with the creation of a gamified experience. These include Classcraft, 3DGameLab, Gradecraft, and TheVirtualLocker. Goal – The unit of study is considered one module – Rules are outlined clearly with a tutorial on how to play the game. Personalized– Modules contain multiple small quests with product options that practice a skill. It can be as simple as providing tool choices to produce the same outcome (example: video, paper, slideshow). These detailed quests are delivered at once, however, suggested due dates assist with time management. Individualized – Each project option comes with multiple modes of learning. The goal is to provide at least text and videos/video tutorials for each learning objective. The instruction is delivered in the multiple modes as well. Playful – the content needs to be playful. Rather than stamp “game” on a packet of worksheets, the content needs to be challenging and engaging in a playful manner. A story line can be added. Collaboration – Students are encouraged to collaborate and team up to complete tasks or modules. Team play is equally engaging in games. This can motivate non-engaged students. Modding – Students may choose to modify their experiences as needed to reach their goals. Scoring – Point values are experience points and they vary based on level of difficulty in each module. If a particular skill is challenging for a student, he/she can elect two easier tasks with lower point values versus one more difficult task valued at higher point value. Each project option contains a point value as well as the components within each project. Badges may be awarded for completion of key tasks. For example, students may earn a collaboration badge for choosing to work with others. Final/Unit Grade: The goal is to complete each module attempting to accumulate points. Within each module, there is a threshold expectation of points which translate to the “A” – students can reach above that point value in search of the “High Score” for each module or each unit. High Score (to be debated) is posted and rewarded with an achievement award at year end. Semester or trimester format classes each have High Score, but there exists a Grand High Score. There are several teachers already running with the movement. There are plenty of examples to learn from. My journey begins now. As a technology teacher, I often focus on tool instruction. As an integration specialist there is less emphasis on tool instruction but more emphasis on choosing tools to accomplish a task. As an adult looking at the whole picture, my primary goal is to prepare students for life during and after high school. More and more I feel like a life skills teacher or a home economics teacher. Like learning to be healthy through PE, boil pasta, or learn to balance their checkbooks, it is imperative that I prepare them for what is beyond the walls of K-12 education. Changing technologies are exciting for everyone. So many of us latch onto new technologies in our free time. Today’s kids are no strangers to the latest technologies, limited only by their allowance. From Facebook to iTunes, GarageBand to YouTube. Oh yes, iMovie is fun. These technologies will be there and grow with them for years to come. Knowing something about them is useful. As citizens of this digital age, it is vital to know effective uses of advanced techniques in order to be efficient content creators and digital-literate consumers of information. What tools should we be using in education? Let’s consider a broad brush and look at the big picture. What is the value of some of the Web2.0 tools or tablet apps that are emphasized now in education? Sure bells and whistles are attractive and motivating, the glow of a new app on an iPad is very exciting. I explore tools in my technology classroom and have tried some of the latest-crazed tools such as NING, Edmodo, Wallwisher, SlideShare, Animoto, PBwiki, Prezi, WizIQ,, Quia and VoiceThread. Remember those? And OMG, there are so many more. I have distributed many logins to my students and had my own content die a slow death in many online environments. At one point I had so many pots in the fire that I found myself confused, and my students, too, were increasingly annoyed. Video/slide tools like Animoto or SlideShare create an easy cookie cutter approach to video- or photo-sharing creations. Sites like NING and Edmodo provide a simulation of a social network that have been used in an educational setting. Personally I latched on to NING as a teaching tool and my PLN. I’ve enjoyed manipulating the tool to do many things for my classes, but with many tools I’ve always found limitations. Nonetheless, NING was once free and help promise for educational use that I revered as the tool that was going to float to the top, become mainstream, and I wasn’t going to have to learn another tool ever again. It was viewed as a “safe” protected environment. For me, course management with NING became too cumbersome and soon lost its appeal. It wasn’t designed for what I needed, and students had to log in to yet another “thing” and NING as a platform never took off with the general public and my PLN anyway. Edmodo is another social network, which includes grading, group creation and has some appeal. Students can post content and carry out discussions. It is a decent PLN too. As educators we gleam when we can share our month-long student projects which demonstrate six minutes of understanding. Kids think it’s fun the first few weeks. It looks like Facebook. 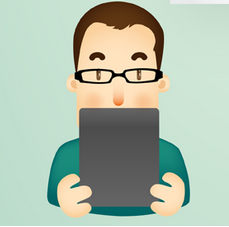 Online apps and iPad apps are the hottest things to talk about in education. Emphasis on technology tools show up more in educational literature and make for filled conference rooms and large-budget purchases — higher than assessment and pedagogy. Tom Daccord of EdTechTeacher said in a speech, “Future Learning Spaces”, we have adapted iPad app and iPad devices on an unprecedented scale. There is an overemphasis on content apps. While the popularity of these tools have been gaining in education, it begins to become apparent to me that using social networks like Edmodo in schools provides a false sense of the real world. Continuity between what tools are mastered in school and what tools are needed in the real world is overlooked. Far too much focus and attention is placed on asking educators to use these tools in their classes as a way to improve their technology use in education. Especially when common, free everyday tools are available and present already. Efficiency is important in time on learning. Teaching with multiple tools at once can be time consuming. From creating and managing accounts to students having to use trial-and-error techniques to learn a tool, the heart of the lesson can be compromised. As a tool teacher, it is important that I provide students with experiences that will have lasting effects. Time dedicated to tools like Edmodo for me might be wasted time. Will kids leave it behind as they go on to college? What tools will they be using after high school? How many tools come and go, close up shop and disappear? Clearly we should look at learning management tools that are used in colleges. Tools such as Blackboard, Moodle and Desire2Learn are ones that come to mind. Maybe that is not a financial option or maybe a bit too “serious” for a middle school student. Regardless, if sharing content is my goal, there are more mainstream tools I’d prefer to use. Facebook may be a stretch. It provides too many opportunities to cross over into personal life with professional/educational life. Not a good place for file delivery. It has potential, but I’m not ready to use it as a “learning tool”. A group on Google+, “Using Google as a Free LMS” explores the idea K-12 and higher education using Google as a free learning management tool. The concept of using a tool that may be already in the hands of students and sure likely to be around in 10 to 20 years makes sense for exploring this concept. What do we know so far? We know that Google is a long-standing company. We know that their tools in the simplest form can be used in education. The tools are great for collaboration and sharing. Digital portfolios can be created with sites and blogs. 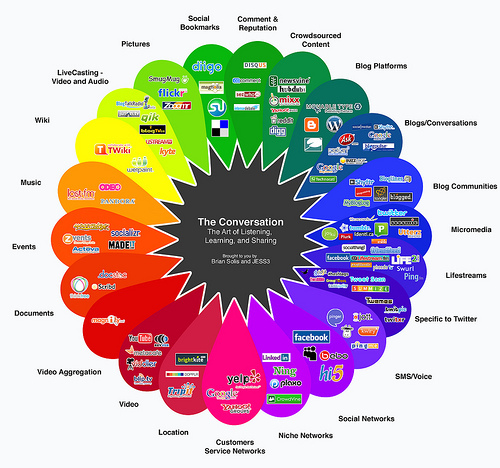 Conversation can happen in discussion groups, Google+ circles, and comments on documents, presentations, and drawings. It is no secret that Google is a leader in providing learning tools for students. These tools can be carried with them into the real world as well as the products they have created. A digital portfolio that can be recycled into adult use. How does it fare with time efficiency? Google has presented itself as the easiest most diverse online environment to date. All you need is a free Gmail account. The library of tools Google provides integrates nicely with each other. File management and online sharing are a cinch. Google apps for education/business allow for administrative control. It can be deployed throughout the entire school community with little professional development. Moreover it is cross-platform.. And it syncs with a phone or tablet. This article is part of a series of articles about my exploration of the tablet/iPad in education. 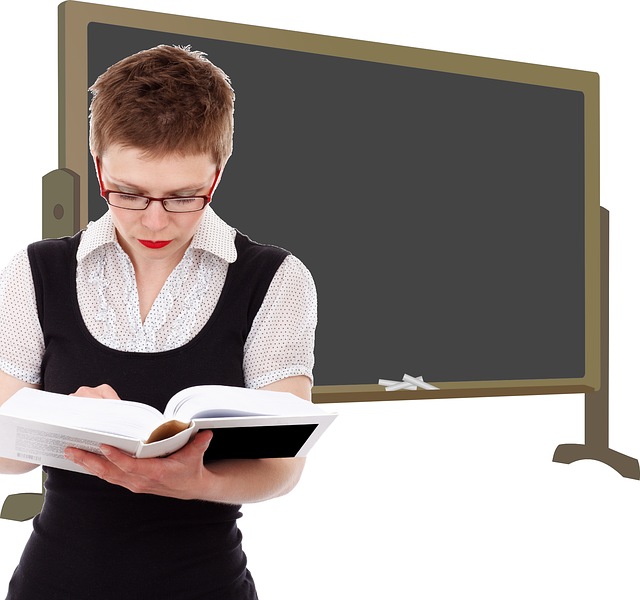 This article includes the ingredients, trials and tribulations of the Smart Board alternative. Find out how I ran into problems with my projector and AirPlay connections so you don’t have to. Links to each of the articles will be posted here or elsewhere inside the blog. It combines a “Leap of Faith” series with reflections on dual-platform knowledge; it will encompass a grant initiative to study a Smart Board alternative, include applications of use for both the Android and iOS, and explore creative ways to use the tablets in schools, including but not limited to, app creation. The series highlights the benefits and limitations of either platform, tips, tricks and workarounds or the technical compatibilities with everyday world uses. I intend to reflect on the social implications, as well. You will find the links to each article at the bottom of this one. Return here for updated link additions. The essential question is: How do we prepare our students for a mobile world and create an inexpensive projection for presentation of material to a broad audience? I first want to address how I made connection to my existing projector using the Motorola Xoom tablet. My existing Dell projector only has DVI ports closest to the HDMI outputs of the Xoom. The trick was that I needed to put together the necessary adapters. Simple. The ideal connection was HDMI mini to HDMI to DVI. Great! Well, frustratingly, when the HDMI port is plugged in, immediately the sound is diverted to that port and not played on the device. Because DVI is not a sound-carrying connection (at least not in the use of the projector) sound had been muted. Solution: get a projector with HDMI ports. Described in my early related posts, I needed to crossover into iOS; and in doing so, it was time to make the necessary investment in a projector with an HDMI port. Thankfully I found that a professional association I belonged to offered the MassCue initiative grant to educators seeking to enhance technology uses in their schools. I was seeking not only a platform-diverse environment but a Smart Board alternative. At MassCue’s 2011 Conference presented by Burlington public schools, I discovered AirPlay. It was described at this conference workshop that it was possible to connect an iPad wirelessly to a projector. At that point in the workshop I began to block out the rest of the presentation and began to Google. Yes! I thought, it is what I’ve been eager to find. I envisioned walking around my classroom while projecting the content of my iPad to the screen whenever necessary. With a classroom set, I would ask students to show their work, or illustrate their discoveries on the fly with the help of AirPlay. To make the iPad use AirPlay, the Apple TV is the magic device that makes it worthwhile. For only $100 it is a great deal. Not only do you gain the AirPlay functionality, but you also gain Apply TV experience. 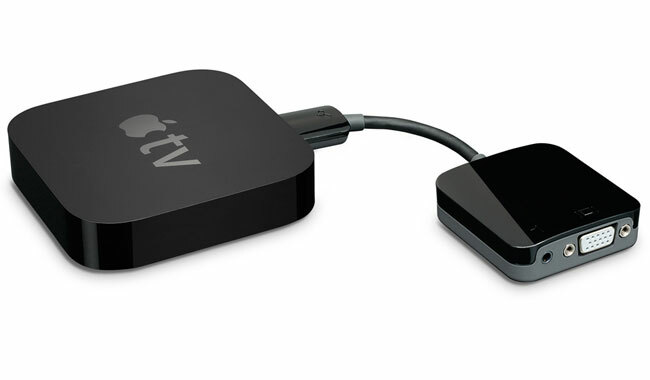 The Apple TV contains an HDMI output. Again, it is necessary to have and HDMI output or the necessary adapters. For those with budget restrictions, and who are comfortable with a reduced resolution display, the adaptors with an existing projector will do just fine. I’ve included a HDMI-to-composite adapter in my bundle to maintain the ability to carry out demonstrations in other rooms, and at conferences and workshops. If the projector did not have an HDMI connection, I needed this kind of a flexible solution. The following describes problems with my initial setup. Please note what to look for in making this kind of connection at your school. It begins with a projector problem. The projector I listed here contains HDMI in and an on-board speaker. I neglected to note that it did not have any audio outputs. In my years of experience, I have never come across a projector that did not have audio in and audio out. I had purchased the projector months in advance of the proposed setup and by the time I needed to return it, it was past the 30-day return window. The Vivitek D538W– 3D DLP Projector seemed like a great projector and is for any other solution. But if you are using an HDMI source with audio, it presents a problem. The tiny onboard speaker is insufficient for a classroom and the HDMI voids any other audio output produced by the iPad. That is, you cannot plug in the mini headphone jack to get audio at the same time. Furthermore, I had problems with the Kanex Pro HDMI/CompositeVID w/Ster Audio CN. I was not expecting any HDCP support issues. I didn’t know what that was. Returning online to the place of purchase a month later, the same search provided a new product: the Kanex ATV Pro. So, for anyone who already has a regular VGA projector, all they need is the Kanex ATV Pro Adapter ($60 or less) the AppleTV box ($99), and an iPad ($499+/-) to be effective. For $658 per classroom (plus wireless access), there now is a smart-savings alternative to a Smart Board. If a classroom doesn’t already have a projector, add in about $400 for that for a total of $1100. There are other things to consider with this or any other tablet setup. The wireless default user setting for the school usually is the same level of permissions as the student user. If these are to use YouTube, for instance, for student projects, there might be a setback. I envision someday this setup in our school auditorium. A presenter might wish to use his/her tablet or phone to present to an audience. If their device does not gain access to an unrestricted/unblocked wireless connectivity, then their presentations may be compromised. One consideration may be to look at how YouTube for schools works within the building. Although I have not tried this, I believe you can achieve a similar experience using the DoceriRemote app for the iPad. It requires a Mac or PC already hooked up to a projector. While this seems like an inexpensive (free) method, my experience with AirPlay has been very efficient and easy to use and can be used with a classroom set of iPads. I suspect that a third party app and a computer client might slow down the interactiveness. As I stated in my previous post, I believe the more “real-world” you can get, the better. AirPlay works with the iPhone, a more common student-held device. I’m not certain how the user community will adapt to these technologies in the future. My suspicion is that Apple and AirPlay will continue the momentum for user-friendliness. There are a number of apps that go well with the projection setup. Showme, Screenchomp, Replay Note, Timer + are a few. In the end, using the Android with a 10-foot cord, or the iPad with AirPlay, you are going to enjoy the experience of having the content at your fingertips. Keynote or Google Apps and even Prezi are great presentation tools for this sort of thing. Actually, there are dozens of ideas I could share with you about presenting on a tablet. Perhaps I’ll save that for another post. For the moment, you will have a device that you can bring home with you to prepare and perfect. No longer will you need to configure and prepare for the Smart Board, if you already have one. In my case, I feel good about saving my school $8000 and a service contract that may extend over years. I am happy to know that my students who use the tablets to present or illustrate what they may know or need to know using technology that is well in their reach. Someday they may need to present in college or in their new job. From what I can tell, mobile phones and tablets will be the tool they will use in these future presentations. Smart Board with Smart Savings: iPads and Tablets in Education (Part 1) – The rational behind avoiding Smart Boards as a teaching tool. This article is part of a series of articles I have written about my exploration of the tablet/iPad in education. Links to each of the articles will be posted here or elsewhere inside the blog. It combines a “Leap of Faith” series with reflections on dual-platform knowledge; it will encompass a grant initiative to study a Smart Board alternative, include applications of use for both the Android and iOS, and explore creative ways to use the tablets in schools, including but not limited to, app creation. The series will highlight the benefits and limitations of either platform, tips, tricks and workarounds or the technical compatibilities with everyday world uses. I intend to reflect on the social implications, as well. You will find the links to each article at the bottom of this one. Return here for updated link additions. The essential question is: How do we prepare our students for a mobile world and create an inexpensive projection for presentation of material to a broad audience? I entered the mobile market in the latter part of 2009 with my Droid phone, reluctant to enter the Apple market (as described in my February 2012 blog post TheLeapofFaith – AndroidtoiOS. I enjoyed the slide-out keyboard and apps the Google world so nicely integrated into my Google-sphere. The idea of a tablet seemed far out of reach for the next few years that followed. The quest began in the spring and summer of 2011 when I noticed several schools beginning to adopt one-to-one iPad initiatives. As the integration specialist, I began to think that it was time to sort out how tablets might be beneficial to my program or any program. My classes, after all, have been designed to prepare students for technology uses in their high school career and beyond. Tablets were hitting the ed-tech world with a vengeance and I needed to get on board. The problem was, how? 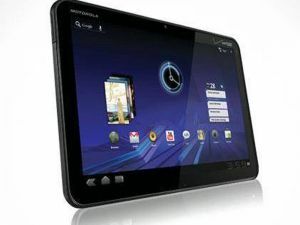 I purchased a Motorola Xoom tablet in the spring of 2011 and explored applications for use in school. Creating apps for the Android with students was easy, thanks to Google’s App Inventor (now acquired by MIT). Having only one available for all of my classes, allowing students time to explore and create using the device seemed cumbersome. Moreover, the initial setup I had on the machine was personalized. App purchases and social network logins were all under my personal accounts. I needed to break away from that. Later in this study I will explain a method I feel best suits this kind of device. Unfortunately, I may have decided on the platform that everyone else was ignoring. I had resisted Apple for so long. Yet iMacs and MacBooks soon began to enter my life. The ed-tech world seemed to be in love with their i-products, and by that trend so many studies were initiated. 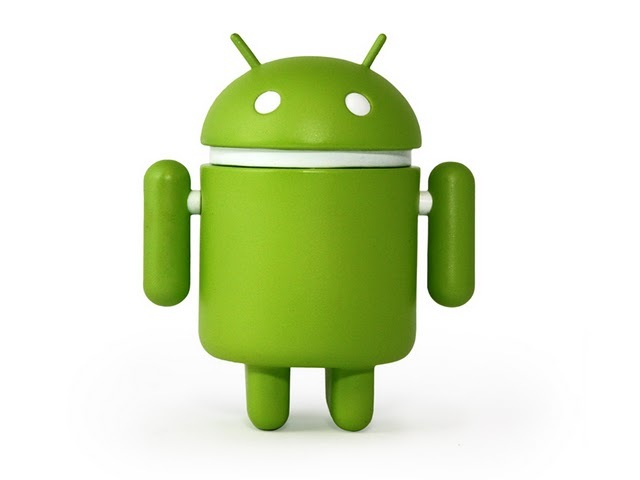 I began to feel like the educational community was missing the power of the Android world and weas being beckoned by the shiny glow of the Apple logo on their devices. I thought since the educational trends were headed in that direction I should research these trends for myself. Our school is interested in this trend and my role at our school obliges me to try. When Apple revealed its educational initiatives, textbooks, the iBooks Author tool, and iTunes U, perhaps this was about time to move in that direction. Thankfully I found that a professional association I belonged to offered an initiative grant to educators seeking to enhance technology uses in their schools. Massachusetts Computer Using Educators Association (MassCue) provided me the edge I needed. Since I passed up opportunities to have a Smart Board in my room. I needed to seek a mobile solution. Something like how I did with a wireless mouse, keyboard and Smart Board tablet/slate in 2008. I was seeking not only a platform-diverse environment but a Smart Board alternative. At MassCue’s 2011 Conference presented by Burlington public schools, I discovered AirPlay. With this project students will use and create apps and use tablets to present content to their classmates. This grant will fuse with an Android tablet purchased by the school, and recent iMac donations from a local college to create a multiple platform experience for technology classes. Students will have the opportunity to review apps and create an app for Android, or iPad. The project will culminate with students presenting a slideshow using Keynote and Google Docs presentation tools. The complete proposal can be found at Mass Cue Grant Proposal 2011. The rationale behind the grant was largely a feasibility study to be able to research a Smart Board solution using real world technology. The grant title, “The Tablet: Smart Board with Smart Savings”, grew out of my quest to find an inexpensive solution to the Smart Board giants. I’ve borrowed classrooms where I’ve used Smart Boards and over the years I’ve seen schools adopt Smart Boards with hopes that putting the technology at the front of the room, students would suddenly become technology literate. I found this to be flawed for a few reasons. First, it didn’t seem to make my teaching to be any more effective. For me, turning my back to students to write on the board felt very teacher-centered. Using the board for any other presentational mode made the Smart Board cost-ineffective. Standing 6’ 5”, the light caused me temporary blindness in the older arm-extended models; and more often than not, the projection needed to be recalibrated. Touching the screen didn’t reliably advance a slide, and the reaching four feet in both directions to click links seemed to be inefficient — more of a calisthenics exercise which put me physically in front of the information. Reading is an active process. Reading on the web/computers is a personalized experience. The reading we do online is rapid, there is an abundance of eye scanning and “click-decisions” that are naturally instant. We appear to do well with explanations and video tutorials more than teacher demonstrations. Sure occasional demonstrations are needed but children seem to get disconnected with the content when time extends, and if one student is using it, others are just watching and being distracted elsewhere. If there is a flaw in the program that is being used, a lot of time is wasted troubleshooting. When all is said and done, the student’s only technological gain is to now advance a slide in their PowerPoint by touching the screen. More progress has been made in education with the rise of blended learning and flipped classrooms than ever before. Student-centered learning activities continue to provide more engagement and increased motivation since its popularity decades ago. The teacher-at-the-front-of-the-room model is clearly phasing out. 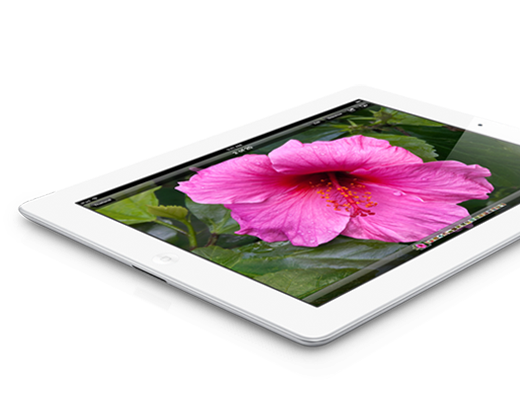 The hands-on world of technology has put mobile technology on the forefront of the mind’s of every individual. Students are facing a future where they will someday need to present to an audience using the most efficient use of technology possible. By the time 10 years passes, they will have forgotten what Smart Board app they have used; they will be far more comfortable using the iPad, iPod Touch or smart phone they may possess at home. More and more business proposals are being prepared on personal devices and brought on location and delivered without preparing Smart Board space. Much of content can now be prepared online for independent review. Often that independent review requires common interactive applications such as a PowerPoint viewer, PDF viewer, YouTube, etc. A Smart Board software is proprietary to the handful of companies that make them and can only survive as well as their business model. The use of a Smart Board by a teacher or student does not strengthen 21st century skills. Fifteen years ago I worked through a school building renovation. The process included a transformation from a two-computer building to a 300+ computer building, all networked with labs and classroom computers. The initial costs were absorbed by building funds and state-awarded capital grants. This conversion to a technologically prepared school was intense. No one really knew where it would go. A total cost-of-ownership had to be created (TCO) and quickly decisions needed to be made on how to maintain it. A full-time IT professional, integration specialist, and hours of professional development soon followed. Energy costs, replacement concerns, and software needs made budgets tighter than ever. Money was thrown at technology very quickly with hopes to improve learning and paint an image that we were, in fact, using the equipment the taxpayers supported. Smart Boards were introduced and quickly gave the appearance that schools were technologically advanced. Open house presentations glimmered of shock and awe. Unfortunately I’ve seen many Smart Boards not being used effectively, even after extensive professional development has been implemented. These were often glorified PowerPoint clickers. Often the devices would go out of calibration or fail to function altogether. Because of its proprietary nature, this expensive piece of hardware needs servicing by the installing agent. There are not common repair tasks which can be done in-house, thus creating a larger hole in the technology budget. With technology advancement being lightning speed as it has been, it is no longer a question of improved learning but more of a race to provide access to tools. Schools have changed drastically. Knowledge comes from a vast web of resources and teachers now merely guide student learning. Some now play with information every day at home. Focus now needs to be moving into a direction where we provide opportunities for students to use the tools they will need to know in the creative job market today. Without the support of the school system, and due to economic disadvantages, many students will not have acquired creative 21st century skills as some of their peers have. Schools, community media (television) centers and libraries are becoming more and more united as collaborative media centers providing direction for students’ acquisition of knowledge. I grapple with specifications and connections using tablets as Smart Board alternatives in my next post. Look for that post and other upcoming future posts in this iPad/tablets in education series. Next: Smart Board with Smart Savings: iPads and Tablets in Education (Part 2) – the ingredients, trials and tribulations. Find out how I ran into problems with my AirPlay connections so you don’t have to. Aah, summertime! Looking for some digital information to consume this summer while on vacation. I have used podcasts and audio books previous summers on my Droid 1. This is the first summer with an iPad and a Motorola Xoom tablet and I am looking to maybe transition into the iTunes world, perhaps a real “iPod” some day, as well. Digital reading in the sun may be hard. So this year it might have to be a nice blend of paper, digital books, and audio books. But really I’d like to find out where I can get all of my content in one organized manner including the audio content. 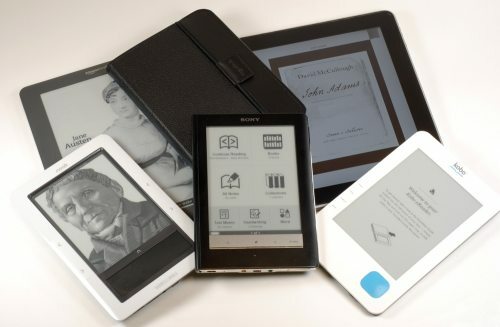 I’m not going to review the different eBook reader devices. There are plenty of review sites for that. And it all comes down to the almighty dollar. I’m simply going to reflect on what choices I have at present and where I might get my content. I have an iPad2 and the Motorola Xoom (Android). I’m largely invested in Google right now. I love the Google apps environment, email, calendar and now app store world that just seem to jive nicely. The high school that I teach at is going to roll out Google Apps for Education accounts for everyone next fall. I’m going to research over the next few weeks to determine what is right for me. Sure I could go out and buy ONE device that someone will tell me is the best for digital reading. I’m not in the position to do that. I know the iPad, for example, receives bad reviews for visibility while in the sun. This might be a deal-breaker for me. Again I need to find out where to invest my purchasing from content sources so that they might be transferred to other devices in the future. I’m looking into simplification of my general media management and consumption. With countless apps, Google products, and content stores online, I would like to close out some accounts, delete some apps, and focus on a key set of tools and/or places to get my content. This post is written in hopes to gather responses filled with good suggestions for the best way I can read my stuff. C/W Mars – http://www.cwmars.org/ Our Western Massachusetts Library system. They have made it easy to get a paper version of any book, CD, or DVD and have it delivered to our local library. They have a digital library, sometimes limited, in which you can download a client on your computer or an app for your device for reading or to listen to audio books. I have not yet tried to read a book using this method. Until now, I’ve waited the few days for delivery of the paper version. Boston Public Library –http://www.bpl.org/ Our state capital has given us all access to the Boston Public Library’s digital content. I have used this source a few times when I couldn’t find something in C/W Mars. At one point I ran into trouble with the accounts within my Android app. Audible.com (Amazon) http://www.audible.com/. Great stuff. They have some of the best readers in the industry. I have used the free download copy but have yet to purchase from there. Web content – Twitter, blogs, social networks and news. I have a few aggregators such as Google reader. But I really need to do some summer cleaning and clear out some unwanted blogs, and narrow down my scope. I’m trying some apps, Pulse and Flipboard. These have been good to me. Barnes and Noble – http://www.barnesandnoble.com/ Does the Nook content work on Android or iOS? Is there an app for that? Yes there is. But is the format universal enough that if Barnes & Noble goes broke, will my book be available for future consumption? Is there a resale market? Like with a paper book, can I resell it when I’m done? Amazon (Kindle app) – http://www.amazon.com/ Perhaps the most attractive option for me. I read that the app looks pretty good on the iPad, I can choose between any of my devices and I’m not locked into Apple with my new library. Further it is the same login for Audible and almost every other purchase I’ve made. I’ve been using their cloud drive music and like it very much. They’ve got Android apps, movie purchases and movie rentals, too. Looks like with this choice, I can choose the platform I want to use for reading. If maybe my iPad is being used by another family member, I could get on the Xoom and pick up where I left off. I’m tired of having so many accounts in so many places; I have too many irons in the fire with accounts all over the place. I’m having trouble keeping up with my credit card info, shipping addresses, passwords, and login names that I just want to wake up, turn on and read. I really want to know how to best choose the content that can be ported from platform to platform. In 5 years, I hope to be able to store my books on a new device with ease. The decision to write this article and make my process public was inspired by an article I read on elearn mag.